Though it may lack the sensual joys of shuffling beneath the jittery florescent lights of Blockbuster Video, chewing on Red Vines and trying to decide which sequel of Hellraiser to watch next, the Gumroad Rentals feature offers your customers an incredible rental experience, and allows you a great way to diversify your Gumroad store. If you plan to sell videos on Gumroad, have existing video products, or have bundled products that contain video files, you can set up rentals at any time. When they buy a rental from you, customers will have 30 days to stream (not download) the video files. Once they click "play" on a video file, their access to this file will expire in 72 hours. In its existing functionality, you can not alter the time frame of rentals or set your own limitations on products. The following file types are streaming-friendly, and will work not only on desktop and laptop, but through the Gumroad mobile app. If you have not created a video product before, you'll need to start at your Gumroad products page. Click Add a product, Product, and then give your product a name, price, and add a file or two (or three, or fifty) to it. Click Add to move forward. For more detailed instructions on adding a product, see this article. 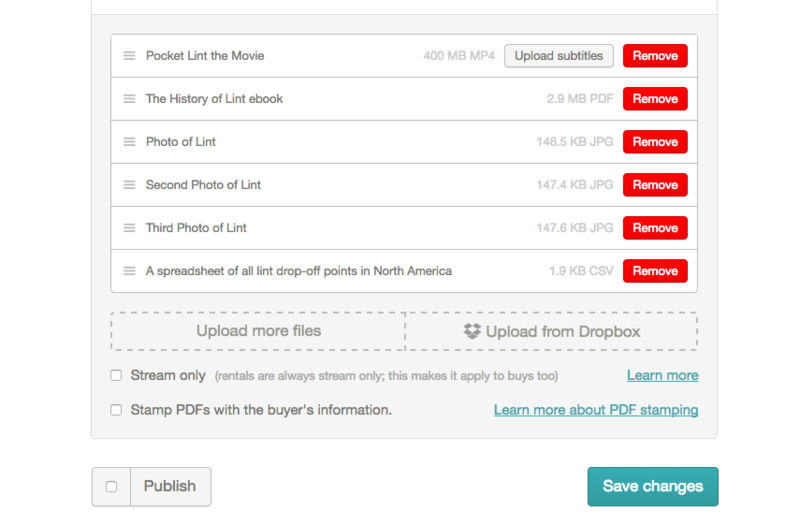 After your file is uploaded, Gumroad will recognize all video files and prompt you to click Offer Rental. Click that and it will show you a blank field to enter your rental price. 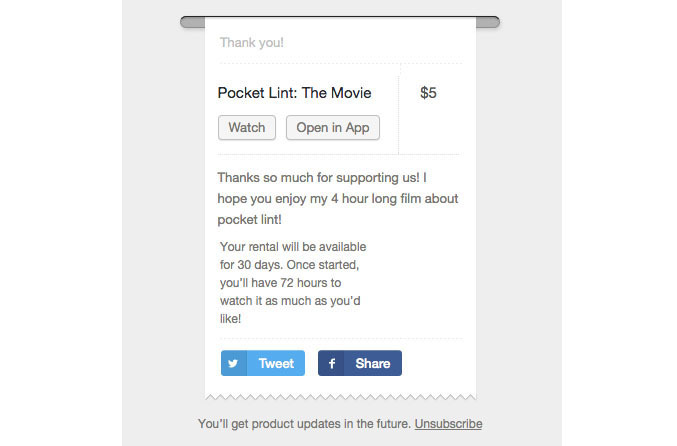 Your product can now be either rented or bought. Click Save changes to, well, save your changes. If you want your product to be Rental Only, just click the X above the Buy box. If you ever want to bring back the ability to buy your product, click Offer buy, set a price, and save your changes. To remove the ability to rent, just click the X over Rent. You can set the price of your products and rentals to anything you like, from $0+ to $5000 (USD). If you are allowing your customers to set their own price for the product (i.e. "Pay What You Want" pricing), be aware that you can't set a suggested price for the rental, only the buy-able video. Learn more about Pay What You Want here. You can also use offer codes to make rentals entirely free for your customers. Learn more about creating free products here. If your product features multiple files, and one of these files is a video file, you can still set a rental price. However, the rental rules will only apply to the video file in that product. So, for example, if your bundled product contains a PDF file, an image file, and a video file - you can set a rental option and price, but your customers will be able to download the PDF and image file as many times as they like. Their limited access and 72 hour cutoff point will only apply to the video file. If you have both the Buy and Rent options active, your customers will see buttons for both options on your product page. By selecting the Rent or Buy buttons, the price of your product will automatically change, and they'll be able to proceed with their purchase. Once they've purchased their rental, they can watch it immediately, or open the video file in the Gumroad app (in case you missed it, we have them for iPhones or Androids). If your customer does not immediately watch their purchased video, we will send them reminders that their rental is expiring, because we are nice like that. Gumroad sends these emails seven days, three days, and 24 hours before their rental expires. These emails include links to the rental product. Once they start watching it, they'll receive no more emails from Gumroad - unless they've invited themselves to our holiday potluck, in which case we will contact them in early December about what kind of dish to bring.